Distribution & Habitat: Maranta leuconeura kerchoviana are native to the tropical Americas, particularly Brazil Rainforests. The leaves have a habit of lying flat during the day and folding in an erect position at night, hence the common name “prayer plant”. Description: Trailing tropical plant with leaves alternate, elliptic with squarish dark green patches with triangular notches arranged along the rachis. 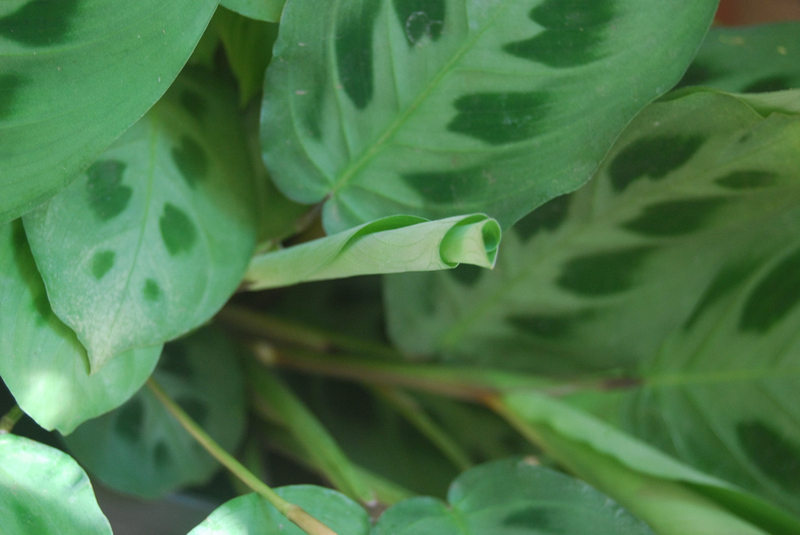 New leaves appear from the sheathed leaf-stalk. 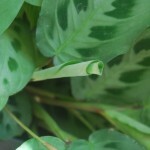 The Maranta leuconeura kerchoviana is a small tender, evergreen perennial forming a clump of broad, oval, green leaves. The adult plant reach the height of 30 to 45cm ( 12-18 inch) with a spread of 30 to 90cm ( 12-36 inch). Flowers are white with purple spots and not showy, blooming in summer. 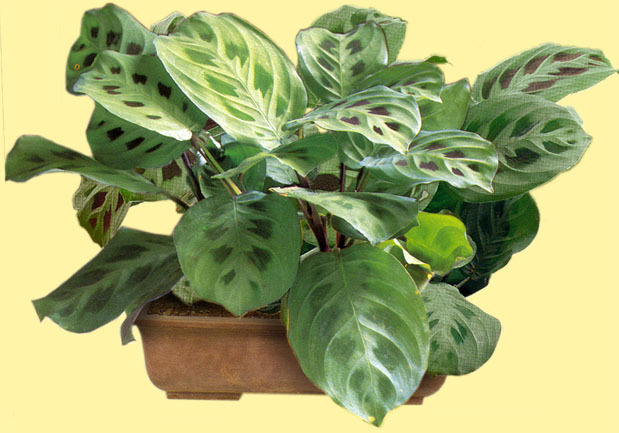 Houseplant care: Maranta leuconeura kerchoviana should be trimmed once or twice a year in order to keep its vigor. Repotting should only be done if the plant out-grows its container, usually once every two years. Water: In spring through fall, water regularly with tepid water so the soil stays moist. Don’t use hard water as these plants are sensitive to fluoride in tap water, which can cause brown leaf tips. Water plentifully as much as necessary to keep the soil thoroughly moist in active growing period. Empty the plant saucers after watering, to avoid that stagnant water could damage the roots. During the winter rest period water sparingly, allowing the top half of the soil to dry out between waterings. Light: Keep the plants out of direct sunlight; their colors can fade in light that is too bright, or their leaves can be scorched. These plants do well under fluorescent lights. In winter, move the Maranta leuconeura kerchoviana to a well-lit but sunless spot. Temperature: Average warm indoor temperatures are appropriate for Maranta leuconeura kerchoviana; avoid temperatures below 12oC (55oF). An ideal year-long temperature in 18-21oC (64-69oF). Humidity: Whenever the temperature climb over 18oC (64oF), it is a good idea to increase the level of humidity by standing the plants on trays of moist pebbles and spray them. Use soft rainwater to mist the Maranta leuconeura kerchoviana. Fertiliser: Feed regularly about every two weeks with a half-diluted liquid plant food during the active growth period; reduce feedings in winter. Potting and repotting: Use a soil-based potting mix. Move Maranta leuconeura kerchoviana into containers one size larger in spring. Maranta leuconeura kerchoviana do not have a deep root system and grow well in shallow pans or half-pots. Propagation: Maranta leuconeura kerchoviana can be propagated through division in spring or by cuttings taken during the warmer months. Take cuttings 10-12cm long (4-5 inch) with three or four leaves and trim off any leaf-stalk sheaths that would be bellow the soil surface when planted. Plant each cutting into 5-8cm (2-3 inch) pot containing a moistened equal-parts mixture of peat moss and sand, enclose it in a plastic bag and keep it in a fairly shady place. Rooting should normally occur in four to six weeks; thereafter move the new plant into a shallow pan or half-pot of standard soil-based potting mixture and treat it in exact same way as a mature Maranta leuconeura kerchoviana. Problems: Maranta leuconeura kerchoviana is generally disease free plant. Pests: Watch for spider mites and mealy bugs. Prevent the spider mites to appear through appropriate humidity. The plant can be treated with an insecticide. Too-dry conditions also can cause leaf loss. Leaf problems: Brown leaf tips may be an indication of spider mites (see above) or may mean the air is too dry. Remove the dead leaves, and mist the plant regularly. Yellowing, curled or spotted leaves may indicate under watering. Limp stems indicate over watering, particularly in winter.